Here's an easy and delicious deviled egg recipe. I'm glad I know how to make deviled eggs! I like to take them to potluck lunches or suppers. Everyone seems to like them, and they always get eaten. 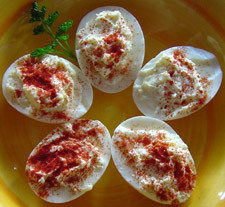 Deviled eggs are a great picnic food, too. Since they contain mayonnaise, they must be kept cold. Use a cooler or an insulated carrier with ice or frozen cold packs. The optional Parmesan cheese in this deviled egg recipe adds a lovely subtle flavor. Leave it out if you're in a rush; your eggs will still taste great. The paprika can also be left out if you don't have any on hand. It is mainly for appearance rather than for taste. Cut the eggs in half, lengthwise, and remove the yolks. Arrange the egg whites on a plate. Place the yolks in a small bowl. Mash them with a fork. Add the mayonnaise, salt and pepper to taste, and the Parmesan cheese if you are using it. Stir until the mixture is well blended and creamy. Using a small spoon, fill the hollow in each egg white half with the yolk mixture. Sprinkle the eggs with paprika. Use plain yogurt instead of mayonnaise. (The flavor will be quite different.) Or use a mix of mayo and yogurt. Make your own homemade mayonnaise. Add minced vegetables to the egg yolk mixture. How about green onions, sweet red pepper or celery? Add another flavoring to the egg yolk mixture. You could try a bit of pickle relish, or some horseradish, or a bit of mustard. Use your imagination! Garnish the eggs with parsley, pickle, chives, or whatever your creative mind comes up with! You can remove the yolk from the egg with a small spoon, or just "pop" it out with your fingers by pushing gently on the back of the egg. To pack deviled eggs in your lunch, put a folded paper towel in a plastic container. Lay the eggs on the paper towel and put on the lid. This should keep them from sliding around and getting messed up before you have a chance to eat them. Return from deviled egg recipe to egg recipes.